Last week I had a hankering for some pineapple upside down cake, brought on perhaps by the mass of pineapples available at the greengrocers for not much money. However, they were a little underripe so I haven't been able to bake with them until this week. ...neither of which was quite what I had in mind. In the end I adapted this recipe. Get out a cast iron skillet. Mine is about 12 inches across and maybe 2 inches deep (see picture below). This would probably also work in a big saucepan, if it is one that will also go in the oven. Melt the butter and sugar over a gentle heat, bring to a bare simmer and then stir in the pineapple juice you have managed to save whilst cutting the fruit up. Cook until a sticky syrup has formed. 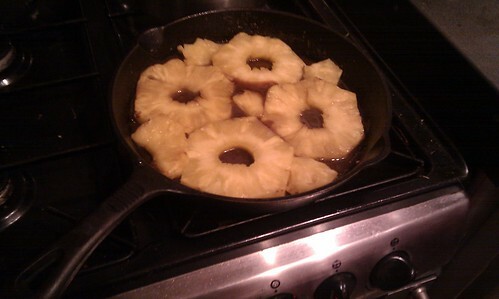 Lay the pineapple rings in the syrup. If you want to add cherries, do this now. I didn't, but only because I didn't have any. Now make the cake batter. If you have only one electric whisk, follow my lazy-girl instructions to avoid having to wash it halfway through. First, separate your eggs. Put the whites in a bowl with the cream of tartar and whisk until you get soft peaks. Set these aside. Now cream the butter with the sugar until fluffy. Whisk the egg yolks in, one at a time, followed by the vanilla. Add the flour in three batches, interspersing with the milk (flour-milk-flour-milk-flour) and adding the baking powder/salt to the flour as you sift it into the cake. The batter is quite stiff at this point. Now introduce your egg whites. I find the easiest way of doing this is to sacrifice one fluffy spoonful to loosen up the batter, and then gently fold in the rest in two batches. Be gentle and respectful of the egg whites and they will pay you back in spades. Spoon the batter over the waiting pineapple and bake at 180 degrees C for 45 minutes or so, until a toothpick comes out clean. Turn out onto a plate and serve with vanilla ice cream. I had a little fear this cake would rise up over the low frying pan, but even though is threatened to it stayed put. I was also afraid it would stick to the skillet and I'd end up soaking it off in a bowl of hot water, but that didn't happen either. It's quite a flat little cake with a brown, syrupy topping - not like the primary colours of the pineapple upside down cakes I see elsewhere - but it is hella tasty. I also found some gooseberries for sale in the greengrocer this week and I am currently concocting a cupcake recipe with them. Watch this space.